The lands of Bohemia are rich with history. I reside in the capital city of Prague, the traditional seat of power for Bohemia. Please See the YouTube Videos on Czech History at the Bottom of the Page. The Premyslids were a 9th century to 12th century Bohemian royal dynasty that ruled over Bohemia and Moravia, and areas of Hungary, Silesia, Austria and Poland. Later, the ruling House of Luxembourg (1310 - 1437) claimed title to the crown of Bohemia through relation to Přemyslids. The House of Habsburg (ruling 1526 - 1918) claimed title to the crown from its relation to all previously ruling houses, including the House of Přemysl. Legendary Princess Libuše, Prince Wenceslas, and Premyslid King Otakar II were all of this dynastic line. The House of Luxembourg was a late medieval European royal family, whose members between 1308 and 1437 ruled as King of the Romans and Holy Roman Emperors as well as Kings of Bohemia (Čeští králové). Charles IV was of this line and his rule over Bohemia may have been the most impressive as he was also named Holy Roman Emperor in the 14th century. The Habsburg Dynasty, also known as House of Austria, is one of the most important royal houses of Europe and is best known for being an origin of all of the formally elected Holy Roman Emperors between 1438 and 1740, as well as rulers of the Austrian Empire and Spanish Empire and several other countries. 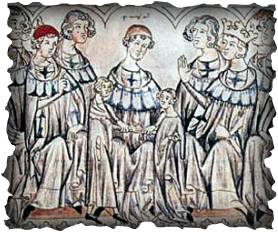 The House of Habsburg gathered dynastic momentum through the 11th, 12th and 13th centuries. Rudolph II, Marie Teresa, and Ferdinand I were rulers with strong interest to the Bohemian lands. The end of the 15th century was one of recovery form the Hussite Wars and the start of Habsburg rule that brought two centuries of conflict between the Bohemian estates and the monarchy. As a result of this struggle, the Czechs lost a major portion of their native aristocracy, their particular form of religion, and even the widespread use of the Czech language. The city of Prague lost most of it's powerful status in this time. This Empire was ruled by the Habsburg family until it's defeat following World War One. The seat of power rested in Vienna and Hungarian influence from Budapest solved many Eastern European issues bordering the Ottoman Empire. Bohemia, part of the Austro-Hungarian Empire, never really saw great political influence in this union. However, the factory and manpower strength of the Czechs and Slavs provided an industrial engine to power the Empire leading up to and through the Great War. 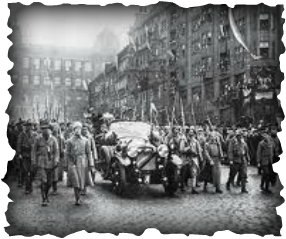 The independence of Czechoslovakia was proclaimed on October 28, 1918, by the Czechoslovak National Council in Prague. Several ethnic groups and territories with different historical, political, and economic traditions had to be blended into a new state structure. The origin of the First Republic lies in Point 10 of Woodrow Wilson's Fourteen Points: "The peoples of Austria-Hungary, whose place among the nations we wish to see safeguarded and assured, should be accorded the freest opportunity to autonomous development." The full boundaries of the country and the organization of its government was finally established in the Czechoslovak Constitution Constitution of 1920. Tomáš Garrigue Masaryk had been recognized by World War I Allies ﻿as the leader of the Provisional Czechoslovak Government, and in 1920 he was elected the country's first president. Handed over by France and Great Britain to appease Adolph Hitler in 1938, Czechoslovakia was annexed by the Third Reich on the pretense of freeing culturally German peoples in the disputed border lands of the Sudetenlands. The Munich Agreement was lauded as bringing "Peace In Our Time" but history would say otherwise. Reinhard Heydrich was given administrative powers of this new protectorate with a dark plan for the Slavic peoples. His assignation through Operation Anthropoid, led to Hilter's retribution of the complete destruction of several Czech townships such as Lidice. Western Bohemia would be liberated by the American Army, while everything east of Prague would fall into Soviet hands. (1946) ﻿﻿Following World War Two, the Communist became the largest party to content for power in the 1946 elections. Party chairman, Klement Gottwald, became prime minister and this marked the only time that a Communist party won a free election in what would become the Soviet bloc. Once in power, the Communists were not about to lose any further elections by popular or representative voting. In 1948, the Communists backed a Czechoslovak coup d'état thus establishing the Czechoslovak Socialist Republic. Warsaw Pact armoured tank divisions invaded the nation as a show of force from Moscow to slow down these reforms and bring the Czech people back into the socialist fold. The result were stronger laws and stricter communist control on the government and society for the next 20 years. The gentle revolution or Velvet Revolution, swept across Czechoslovakia in November and December of 1989 in efforts to break away from Communism and the then Soviet Union influence. School unrest and demonstrations set the stage for the end of 41 years of communist rule and the peaceful formation of a democratic parliamentary republic.